@ iTunes- ը, Spotify, Google Play, Amazon եւ այլն. 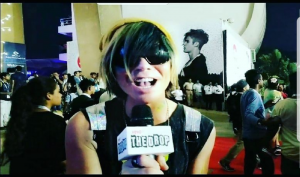 Ian hosts &; կատարում է նախընտրական շոուի համար Justin Bieber Առիթ շրջագայության Հնդկաստանում! Նայիր համար Ian այսօր Մումբայում, India as he hosts the red carpet and performs his single “;Footprints In The Sand”; է preshow համար Justin Bieber! With his platform sneakers, multicolored hair and trademark sunglasses, you won’t confuse Ian Erix with anybody else on the music scene right now. His outrageous style is a talking piece second only to his music which these days is perhaps best described as Electro Punk Pop. Նրանք, ովքեր ծանոթ վաղ աշխատանքների, որ առաջին catapulted Erix է միջազգային ուշադրության կենտրոնում, racked up millions of plays online and landed him on several Top 10 տրամագրերը 3 մայրցամաքների անպայման ճանաչի ստորագրությունների տարրերը իր ձայնի, բայց նրանք նաեւ անշուշտ գնահատում երաժշտական ​​էվոլյուցիան Erix ենթարկվել է գործընթացի կատարելու է իր վիճահարույց նախատեսված նոր ռեկորդ "Scream for Freedom" which is due for worldwide release in Spring 2017. Erix ավելացնում է 17 սկսվում է Մեծ Բրիտանիայի շրջագայության! ©; 2019 Ian ERIX: Պաշտոնական կայքը. Բոլոր իրավունքները պաշտպանված են:.